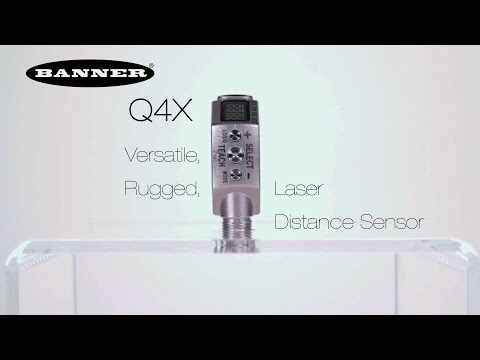 Minneapolis, MN—January 20, 2015—Banner Engineering announces the Q4X laser distance sensor. Featuring superior, versatile sensing performance, the Q4X reliably detects distance changes as small as 1 mm and covers a 25 to 300 mm range across multiple target colors, materials and surfaces. With the ability to detect presence/absence of a target or an object’s orientation, the Q4X solves a variety of sensing applications. The Q4X is optimal for difficult distance-based sensing applications as it easily detects objects regardless of target surface reflectivity, including black foam on black plastic, black rubber in front of metal, multicolor packaging and targets of all colors. Additionally, the sensor provides superior resistance to ambient light interference. Offering a simplified user experience, the Q4X provides a clear distance readout from the highly visible, angled four-digit display that is easily viewed from multiple vantage points. The Q4X also offers intuitive user setup utilizing three tactile buttons conveniently located below the display. For use in wet and high-pressure washdown environments, the Q4X is constructed with robust housing rated to IP69K. Durable FDA-grade stainless steel resists mechanical impact, over tightening and extreme vibration. Ce capteur de distance laser robuste est parfaitement adapté à de nombreuses applications de détection, même difficiles, et possède un boîtier robuste IP69K en acier inoxydable agréé par la FDA pour les applications alimentaires.